Conjugated polymers, beginning with polyacetylene, have long been known to conduct electricity through their conjugated backbone when properly doped, through either chemical or electrochemical means. The majority of these polymers, again due to their conjugated backbone, are also extremely brittle and difficult to process. (1) The addition of more soluble side-chains has frequently improved the solubility and processability of these materials, but the addition of side chains tends to result in a significant decrease in conductivity, particularly for non-polythiophene systems. Blends have also been used to improve the processability of conducting polymers such as polyaniline (PANI), but this method also results in significantly decreased conductivities. Incorporating an acidic dopant moiety (sulfonic acid) as a pendent group for one block of a diblock copolymer is one method that circumvents this lowered conductivity. The other block is a hydrophobic acrylate; the phase separation in this system drives the formation of continuous structures in the acidic phase. 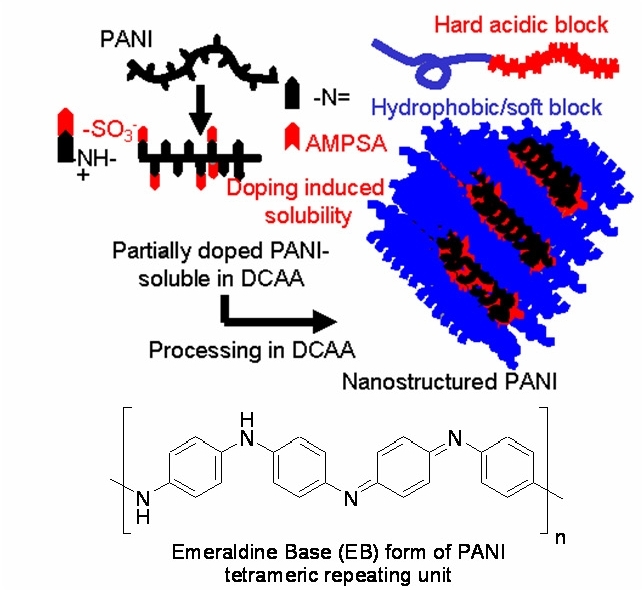 (2) The addition of PANI results in the doping of the conducting polymer by the acidic block, leaving PANI ‘complexed' to the hard phase polymer and thus adopting the morphology of that block. This method provides a means of controlling the conductivity of the material by controlling the proportions of hard block and conducting polymer, and thus controlling both the extent of the doping as well as the overall morphology of the material. Conductivities in this system, using methyl acrylate as the hydrophobic block, have been observed as high as 30 S/cm. (1) Pron, A.; Rannou, P. Prog. Polym. Sci. 2001, 27, 135-190. (2) McCullough, L. A.; Dufour, B.; Tang, C.; Zhang, R.; Kowalewski, T.; Matyjaszewski, K. Macromolecules 2007, 40, 7745-7747.